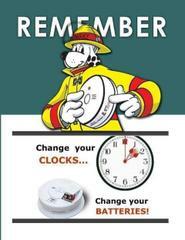 Cinnaminson Police Department: Change your Clocks...Change your Batteries. Are you running around the house changing all the clocks this morning? Don’t forget to change the batteries in your smoke detectors and carbon monoxide detectors. Smoke alarms save lives.